Python hunters continue to remove the invasive snakes from South Florida, and they seem to be getting bigger. The Big Cypress National Preserve posted on their Facebook page Friday that they caught a female snake more than 17 feet long that weighed 140 pounds. The massive python also contained 73 developing eggs. Officials say this is the largest python ever removed from Big Cypress National Preserve and was caught using radio transmitters. The picture posted on their Facebook page shows it took four people to hold up the behemoth! 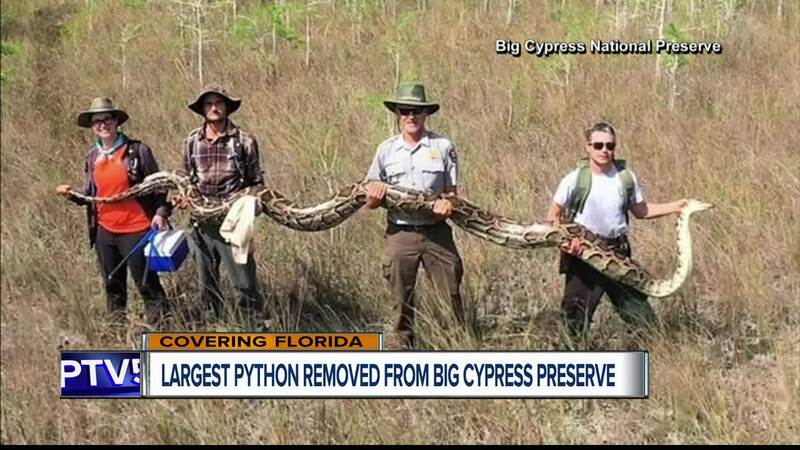 Big Cypress says their team is not only removing the invasive snakes, but collecting research data, developing new removal tools and learning how the pythons are using the Preserve.